I had a thing for mood rings as a kid. The novelty of wearing something that changed colours AND conveyed my emotional state of mind to others was irresistible. As I entered my teen years this turned into an obsession with the Fortune Telling Miracle Fish. Naturally, I had to adapt as an adult. Now I have a craft-based emotional barometer where a quick glance around the house will tell you everything you need to know about how it's all going. A tidy home with only one project on the coffee table means that there is either company coming in the next 10 minutes or I've managed to find a whole lot of zen. A project in the bedroom and living room is indicative of a normal and sustainable level of chaos. 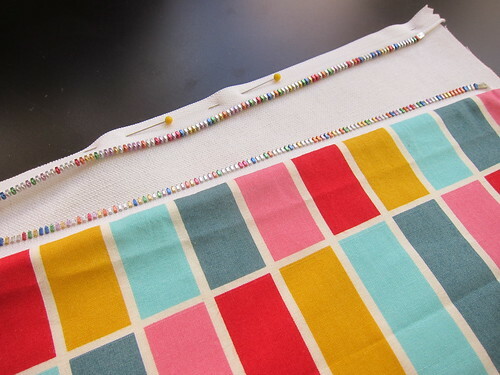 A few projects strewn about on the couch, dining room table and next to the bed with a stack of yarn or fabric on the floor in the spare bedroom means usually means contact with a stressful patch over the last week or so. Barely started projects on every surface with stacks of yarn and fabric "cued up" in the spare bedroom are a bad sign...a really bad sign. Two guesses on where things are this week. 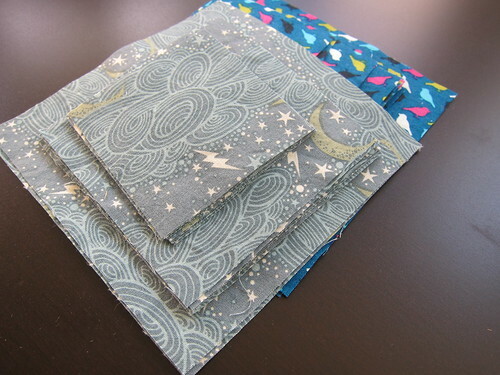 We have bits of fabric that I've been cutting for my On a Whim Quilt on the TV stand. 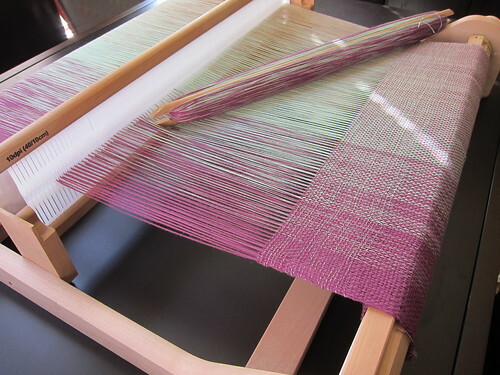 The couch is home to my rigid heddle loom and some weaving on a gradient shawl that I started more than 3 years ago. My school bag is home to the Frosted Pumpkin Stitchery's Halloween Sampler that I fell hard for a few weeks back. The dining room table has a half-finished version of Noodlehead's Open Wide pouch, complete with rainbow zipper. Oh and that's not even mentioning the partly-finished satchel in my craft cupboard, the TWO lap duvets that are pressed and ready to be basted hanging over a dining room chair, the nursing cover on the coffee table that's been cut out and is waiting to be sewn, the two charm packs that are stacked on my nightstand waiting to become a baby quilt and the multiple piles of yarn in the spare bedroom divided into projects...plural. Time to reset me thinks. Any other craft barometers out there? Stop! Wherever did you find the rainbow zipper, I must have me one!!! Hoping that your craft barometer slows down and you are able to add some finishes to your list. I feel all 'out of sorts' when I have many things on the go and I then must run around and finish some to end the angst haha!!! Wow, you should consider joining the Finish-A-Long, we are starting Q4 tomorrow. And I love the rainbow zipper. That sounds so like me! I have a bag in the living room and one in my bedroom right now, but that's just because I had to clean up for my parents to come visit ;) I hope your patch of stress passes soon and with little event! Hope the stress eases soon! 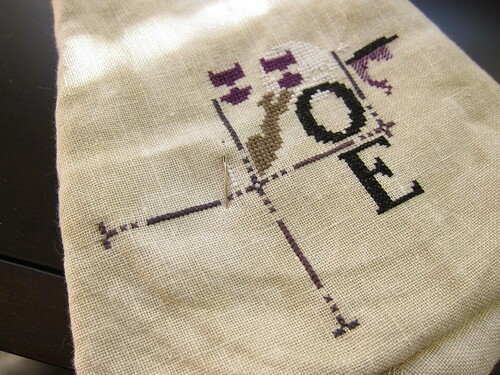 You have so many gorgeous projects underway though, things can't be all bad. That rainbow zipper is so amazing - where did you get it?